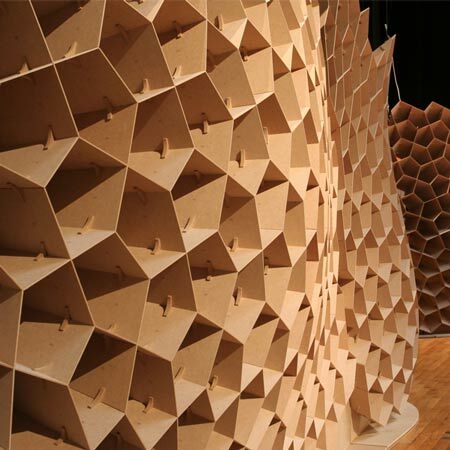 Five architecture students of the Institute for Lightweight Structures and Conceptual Design (ILEK) at the University of Stuttgart have created an exhibition stand with an irregular honeycomb MDF structure. The stand was created to display the work of five young designers at design fair Blickfang in Stuttgart in March. Each cell of the structure is uniquely angled to focus the gaze of people standing outside the wall onto the individual objects within. "Each element of the structure is unique, generated by algorithms based on the location of the wall and the locations of the items exhibited," say the designers. The screens are made up of 2,142 pieces joined by 1,376 unique pairs of connecting components. These components are made of CNC-cut pieces of 3mm and 10mm MDF, slotted together without adhesive. The team included Benjamin Engelhardt, Fred Ernst, Kadri Kaldam, Sebastian Lippert and Christian Seelbach. More information on the project blog. To catch the eye, steer the gaze, and focus attention. That is the idea behind this exhibition stand, designed and built by five architecture students at the Institute for Lightweight Structures and Conceptual Design (ILEK) under the supervision of Professor Werner Sobek at the University of Stuttgart. The system serves as a filter between observer and object. The planar elements of the honeycomb-like structure are oriented at specific angles so that only a portion of the area behind the wall is revealed to the viewer. From the outside, only objects that lie within these defined focal points can be seen. Each of the items on display receives its own focal point, according to its size and location. Inside the wall the opposite effect is achieved – the view to the outside from the focal points is completely unobstructed, allowing a panoramic perspective as the honeycomb elements are aligned perpendicular to the observer’s eye. Each element of the structure is unique, generated by algorithms based on the location of the wall and the locations of the items exhibited. Once generated, the element shapes were transferred directly to a CNC mill for fabrication. This process was performed using a custom-programmed plug-in for a 3D design software package. The honeycomb elements and their connectors were first generated in three-dimensional space. Two-dimensional drawings of the elements were then produced, and using CAM (computer aided manufacturing) software, translated into machine code for the milling process. Labeling the individual pieces was crucial, as the structure comprises 2142 different planar honeycomb elements connected by 1376 unique pairs of joint elements. To maintain order within the system, the honeycomb elements were numbered sequentially, while the connectors were labeled according to the elements they were joining. Fabrication was completed in 13 days, using 204 m_ of 3 mm-thick and 46 m_ of 10 mm-thick MDF (medium density fibreboard). Both cutting and labeling was done using the CNC mill. Waste material was minimized to less then 30% through the use of so-called nesting software. The mill was in operation for a total of 80 hours, with the cutting head traveling a total distance of 2,8 km. Notably, the connectors relied solely on friction without the use of any adhesive. The system in its current stage of development was first used at Blickfang 2009 (Design Fair for Furniture, Fashion and Jewellery in Stuttgart). Its purpose was to draw attention to objects by five young designers presented by Magazin and Süddeutsche Zeitung Magazin. Further development of the concept is underway involving the design of a 3D space structure to be used as a pavilion. Portions of the wall will be part of an upcoming exhibit on Werner Sobek and the ILEK in Vienna, starting in July. Another portion is currently on display at the Magazine Shop in Stuttgart.